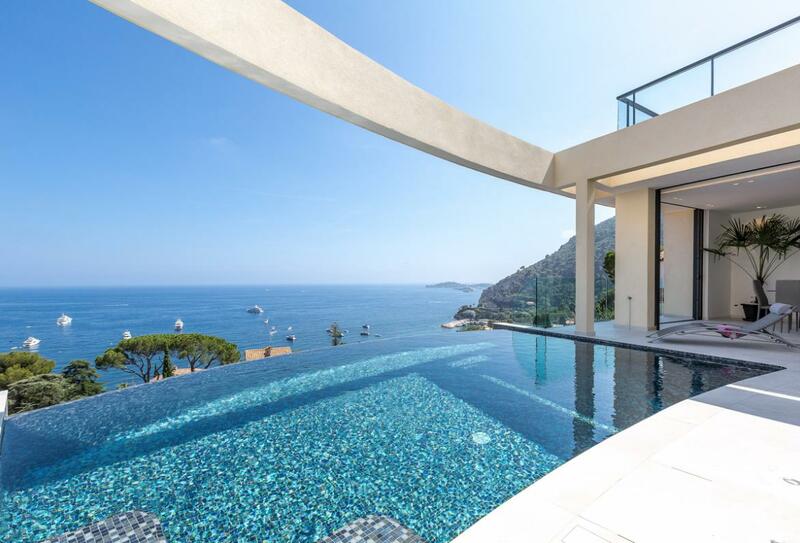 This exceptional and unrivaled villa is located in Eze, between Nice and Monaco, in what is possibly one of the Rivieras' most exclusive stretches. This ultra-modern luxury villa with heated infinity pool, offers its guests full immersion in the Med with its 180° panoramic view of the shimmering azure. With 5 ensuite bedrooms this luxury villa comfortably sleeps up to 10 people. The sun shimmering down, reflecting its rays on the ever-changing sea, the sailboats lazing about along the peaceful bays, the villages tumbling into the ebb and flow of the turquoise waters… that’s the Riviera, a region blessed by the gods, dotted with magnificent homes offering privileged balconies on the Mediterranean, like this 360 sq. m villa with its resolutely contemporary design. Facing outward on to the spectacular view, it’s located on one of the most picturesque and prized sites on the coast: beneath the hillside village of Eze, between Nice and Monaco. The villa offers you the nec plus ultra in the way of architecture and comfort. With its overflowing infinity pool, set in the terrace, it looks as if it were literally suspended over the coast. All of the rooms, including the five ensuite bedrooms, have a magnificent view, thanks to the huge bay windows. The large rooftop terrace is a perfect place to invite friends for a drink or to party under the stars. Household linen, kitchen and bath towels are provided. The beds are freshly made up. A weekly cleaning service is included, as is a complete house cleaning upon departure. You’ll also have some surprises in store to welcome you: you’ll find toiletries in the bathrooms and a little gourmet gift basket in the kitchen. Other services (chef, maid, travel planner) are available on demand. Each of the rooms is equipped with a TV. The villa is air-conditioned. There’s a parking lot for up to five cars on the property. The coastal road between Nice and Monaco is one of the most scenic routes in the world, with absolutely breathtaking views overlooking the Mediterranean coast. The village of Eze located along this road: “Eze bord-de mer”, a seaside resort on the lower ledge and “Eze-village”, on the mid-ledge. The villa is situated in the seaside resort, in a very quiet and ultra-residential neighborhood. Just six short minutes to get to the beach on foot! And you’ll find numerous convenience stores in the village. From the villa, you’ll get a low angle shot of the old town of Eze; an eagle’s nest perched on a rocky outcrop, one of the most picturesque and widely admired sites on the coast. A medieval village with little narrow stone streets, you’ll get a stunningly sweeping view, particularly from the botanical gardens at the top. You can go from one village to the other by road or by using the footpath. The location is ideal for visiting the Riviera’s key cities: Monaco and Nice are only about 10 km or so away. We also recommend that you go to Beaulieu-sur-Mer, 3 km down the road, where you’ll find some excellent restaurants. And don’t leave without treating yourself to a dinner at the Château de la Chèvre d’Or in Eze!